IRVING, TX, December 1, 2018 — The national digital marketing agency Mojo Media Labs announced a major acquisition Tuesday of the acclaimed Indianapolis-based website design and digital marketing agency, SpinWeb. SpinWeb immediately brings some of the country’s most capable website design and development talent to Mojo Media Labs, increasing the scale in which the agency can undertake complex projects for its clientele. Mojo Media Labs, the 2017 American Marketing Association DFW Marketer of the Year and a HubSpot Diamond Partner, now continues its aggressive M&A growth strategy. A leader in the inbound marketing space, and now at the forefront of web design and development following the SpinWeb acquisition, the agency has its sights set to expand its capabilities in marketing and sales technology to provide more benefits for current and future clients. For Mojo Media Labs, the combination of elite marketing and web design/development opens the doors to new possibilities. As SpinWeb becomes more integrated, both Mojo Media Labs clients and current SpinWeb clients can realize the benefits from the combined specializations of the teams. 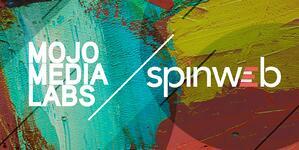 SpinWeb, a HubSpot Gold Partner, will now become Mojo Media Labs with offices in Indianapolis. Rose said there are other opportunities to add even more Mojo Media Labs locations and offices in the future as the team and agency offerings grow, particularly in a direction that expands the company’s potential in sales services. A leading B2B digital marketing agency and certified HubSpot Diamond Partner and Terminus account-based advertising partner, Mojo Media Labs serves clients in the healthcare, manufacturing, and technology spaces via inbound marketing, account based marketing, website development, and sales enablement. Mojo Media Labs also manages the Dallas North and Chicago Northside Hubspot User Groups and Flip My Funnel. To learn more about the company, visit its website at www.mojomedialabs.com. Press Contact: Nikole Rose, President Mojo Media Labs can be reached at 972-815-1081 or nikole@mojomedialabs.com.